Last Saturday, I spoke at the Historic Concrete Theatre with 30+ people. The presentation went well, and the participants left with a greater understanding of photographing birds. The Skagit Valley from Newhalem in the mountains to Puget Sound is filled with migratory birds this year. The last of the Chum Salmon run is happening on the Skagit River, and the last eagle count was 121 between Sedro Woolley and Newhalem. The high count this year was around 250 eagles. This area holds the highest numbers of migratory bald eagles in the lower 48 states (US). There is one last weekend of the Skagit Eagle Festival. This weekend is filled with events. Most are located in Concrete or Rockport, along Highway 20. The image above was taken this month in the Skagit Flats. These are Trumpeter Swans. This flock has both adult and immature birds. The adults are pure white, and the immature are gray. 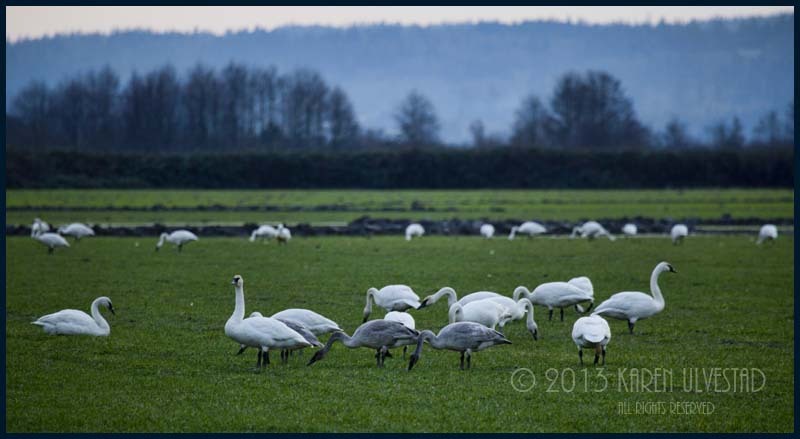 Currently, the swans are feeding between Highway 20, La Conner and west of the Skagit River. There are many flocks in the area, though not all are easy to photograph. The Flats have more Bald Eagles this year. They are hunting Snow Geese and other migratory birds. 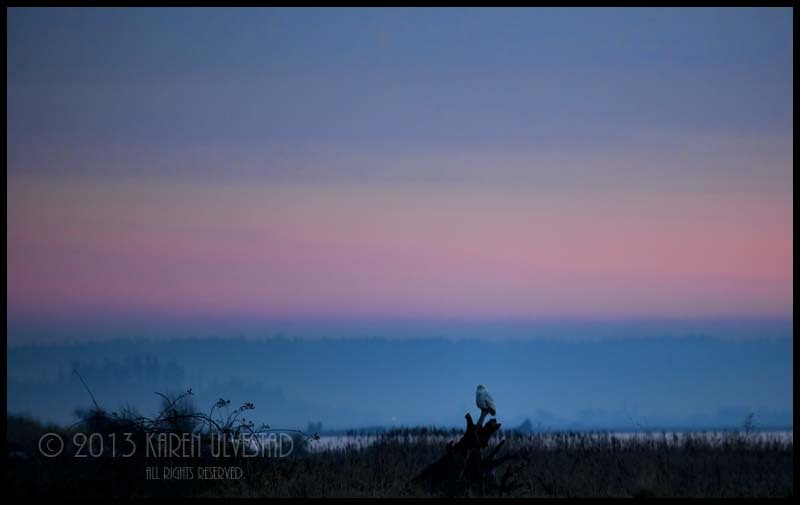 The photo below is showing an eagle feeding on the remains of a Snow Goose. The geese seem to be in larger flocks this year. While we were watching this, two other eagles came in to feed. There was a conflict, though the light was too low to capture the interaction. There is a visiting Snow Owl this year. This one (photo below) was resting on driftwood on the dike. There are several other birds on the Flats, including Short-earred Owl, Northern Harrier, Red-tailed Hawk and various migratory Sandpipers. The presentation at the Skagit Eagle Festival went well. Here is a link to a short video clip of the photos used in the presentation http://www.youtube.com/watch?v=2sGSOvoIm2Q. Thank you Gary. . .